Hello, and welcome to The Very Serious Crafts Podcast, Season 1: Episode 16 – Crafting for Fun and Creative Thank-Yous! In this episode, the Very Serious Crafters say thanks, avoid making a mess, and dodge the dreaded M-word. (That’s ‘moth,’ for the uninitiated.) They also bid a tearful farewell to Haley’s beloved Simon Cat. 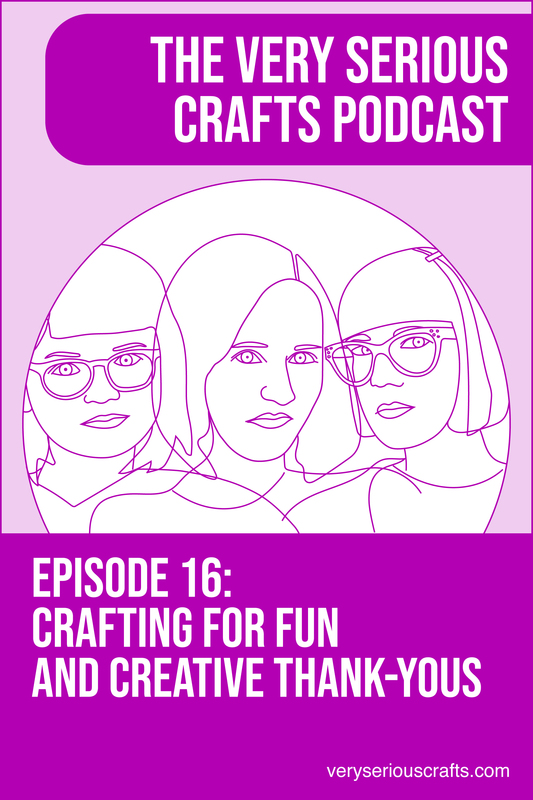 In Episode 16 of the Very Serious Crafts Podcast, the girls gather around the crafty Thanksgiving table and talk about gratitude, saying goodbye, and the projects they have in their not-work tote bags! I’m so sorry about Simon 🙁 Losing a crafting buddy is a sad thing. This Thanksgiving I am thankful for my knitting and having fun podcasts like Very Serious Crafts that connect me with other crafters and make me laugh on days when being a stay at home mom is hard.